Florence Sabin was born in Colorado in 1871, at 25 she began studying at the Johns Hopkins University School of Medicine where she was 1 of 14 women in her class. By the age of 46 Sabin was the first female full professor at an American medical college. If that wasn't impressive enough, then consider that it wasn't until 3 years later that the U.S. Constitution was changed to allow women to vote. Sabin was an impressive medical scientist, her research was largely focussed on investigating the origins of blood cells and the lymphatic system. Her substantial discoveries lead to her being voted into the National Academy of Science in 1925, making her the first woman to gain membership, where she remained the only female member for a further 20 years. Aside from her impressive research output, Sabin mentored many students and influenced policy change. In 1944, 6 years after starting her retirement, Sabin became a prominent public health activist where she chaired a committee that assessed the public health needs of Colorado. In 1947 Sabin said that she was chosen to chair the committee as the Governor had no interest in public health and appointed "an old lady" because he did not believe she would accomplish anything. Her efforts contributed to the modernization of the public health system and the many bills that passed due to her influence are known as the "Sabin Health Laws". She returned to retirement in 1951 so she could care for sister and passed away two years later on October 3rd. 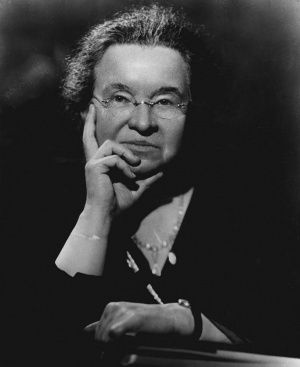 Florence Sabin was a trailblazer medical scientist and public health activist. She broke down the many barriers that women in science face and demonstrated the power of perseverance. Naomi is an active researcher, science communicator and university educator. Her PhD at the University of Technology Sydney is focussed on modelling multiple sclerosis with stem cells isolated from fat. While still a budding science communicator, she has competed at the national finals of FameLab, featured as a biology expert on all 10 episodes of Dr Karl's Outrageous Acts of Science with Discovery Channel and hosted 5 episodes of Sciencey with ABC. You can follow her journey on Instagram and Twitter.